So you just snagged the last pair of wide-leg trousers at your favorite designer’s sample sale. The only problem is: they’re way too long! Ugh, what do you do? Hem them yourself? It’s way easier than it looks, ladies — trust us. 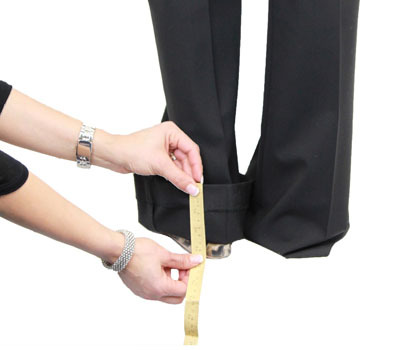 Use these expert tips to help you save some time and money by becoming your own tailor. “On a hard, flat floor, wearing the shoes you plan on wearing with your pants, take a ruler and measure up from the floor,” says Jennifer Dayan, founder of online shopping destination I Found A Secret. Then fold under exactly where you want the hem to be, making sure the fabric is even all the way around. Grab a friend or family member to help you with this step if you’re having trouble alone. Once you have the fold exactly where you want it to be and are positive it’s even, pin all the way around, with the ruler measuring the same distance between the floor and the hem, advises Jennifer. This will help ensure that you don’t make any mistakes and that both pant legs come out the same length. Check your work in the mirror and adjust any pins as necessary before moving on to the next step. At this point, if you have a sewing machine, you can sew all the way around (being sure to cut away the excess fabric first) and re-iron the finished hem flat. “Or, if you’re like me and sewing isn’t exactly your strong point, you can go with one of two other options,” says Jennifer. 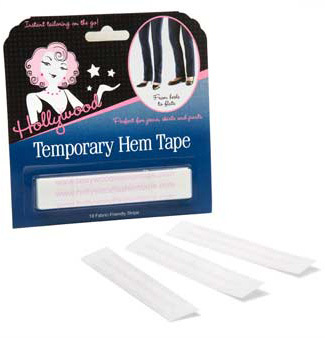 You can use HeatnBond’s Super Weight Iron-On Hem Adhesive, which is available at most fabric stores and comes in a roll, or you can apply two to three strips of Hollywood Fashion Secrets Temporary Hem Tape (available at IFoundASecret.com), which requires no ironing at all and is non-committal to any specific shoe, heel or flat. The latter is probably your best option if you plan on wearing your new pants with a variety of different heel heights. Not wearing your favorite shirt because it’s missing a button? Don’t worry — sewing on a new one is simple and fast.